I’ve posted the Python script I used to make the Pivot visualization of this blog. I need to set it aside for now and do other things, but here’s a snapshot of the process for my future self and for anyone else who’s interested. This tool uses Internet Explorer, so only works on Windows. There is also CutyCapt for WebKit, which I haven’t tried but would be curious to hear about. I’m writing this down here mainly for myself. ImageMagic can do everything under the sun, but it always takes me a while to dig up the recipe for a given operation. Then it walks through the items in the Atom feed, extracting the various things that will become Pivot facets. For the description, it tries to parse the content:encoded element as XML, and find the first paragraph element within it. If that fails, it just treats the element as text and grabs the beginning of it. 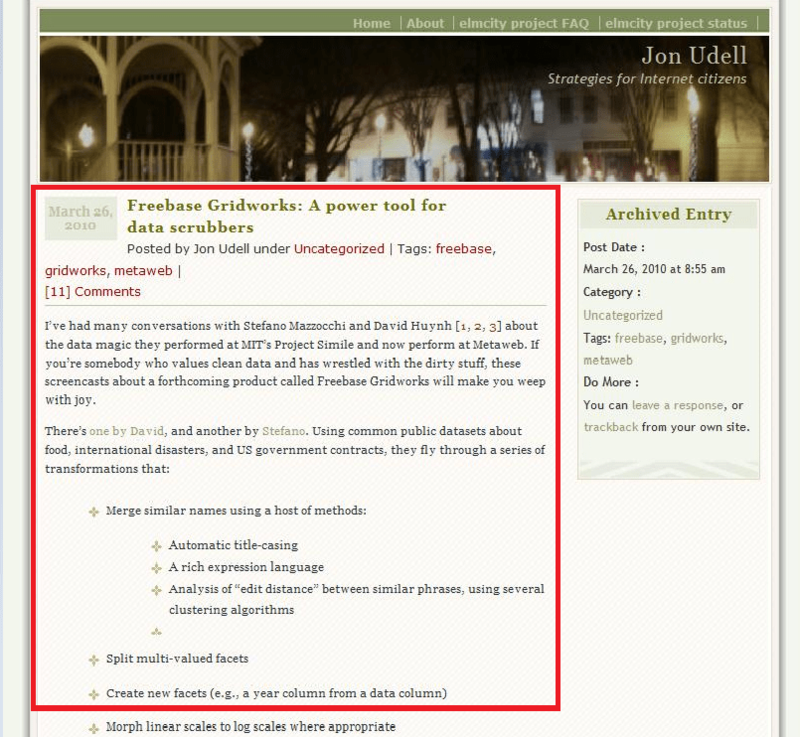 Name="Freebase Gridworks: A power tool for data scrubbers"
Freebase Gridworks will make you weep with joy. But Id="596", which is the connection between dzc_output.xml and pivot.cxml, comes from a counter in the script that increments for each item processed. I don’t know why the numbering of items in the WordPress export file is sparse, but it is, hence the difference. Here are some ideas for next steps. 1. Check the comment logic. I just noticed the counts seem odd. Maybe because I’m counting all comments instead of approved comments? 2. Use HTML Tidy to ensure that item content will parse as XML, and then count various kinds of elements within it: tables, images, etc. 2. Use APIs of various services — Twitter, bit.ly, etc. — to count reactions to each item. Paparazzi http://derailer.org/paparazzi/ and the command-line tool webkit2png http://www.paulhammond.org/webkit2png/ do the same function as CutyCapt but on Mac OS X.
Boa noite, vc pode mim dar uma ajuda? Não consigo colocar fundo branco no deepzoom.